THE STATE'S largest pension fund, outperforming both its benchmark and its peer group, posted an increase for the ninth time in the last 10 quarters to begin its fiscal year with a gain of 4.2 percent. In a quarter when all of its fixed-income managers had negative returns, the state Employees' Retirement System fund rode a strong performance from its domestic equity portfolios. "We benefited from both the managers as well as the asset allocation," ERS Chief Financial Officer Kimo Blaisdell said after yesterday's board meeting with fund adviser Callan Associates. "Over the last year, our managers have done a really good job outperforming the target return by 1.24 percent. It wasn't just being in the right asset class, but it was having managers in those assets classes who picked good securities." Over the last 52 weeks, the ERS fund posted a 15.6 percent gain while its return since Jan. 1 is 6.1 percent. In both time frames, the ERS is ahead of its benchmarks and its peer group of large public funds. 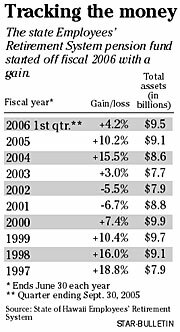 The ERS' winning quarter helped boost its assets to $9.5 billion, up from $9.2 billion from the previous quarter and $8.6 billion a year earlier. The assets include what it makes from investments and brings in from contributions minus what it pays out in distributions. The ERS provides retirement, disability and survivor benefits for 101,300 people, including 63,100 active members. In beating its benchmark of 4.0 percent, the ERS also finished in the 47th percentile -- No. 1 is the best -- of large public funds with assets of more than $1 billion. The benchmark consists of several nonactively managed indexes. Janet Becker-Wold, senior vice president of San Francisco-based Callan Associates, said managers needed to be in the right spot to get good results. "Because of the spike in oil prices, energy was the best-performing sector, up 19.4 percent," Becker-Wold said. "It was a very narrow market in terms of performance. If managers were out of energy, utilities (up 6.9 percent), IT (up 6.2 percent) and industrials (3.4 percent), it hurt their performance." Bank of Hawaii, which has been on the watch list due to performance and organizational changes, had the best ERS performance of any large-cap manager last quarter as it posted a 7.9 percent gain for the core (growth and value) class. That performance ranked Bank of Hawaii in the third percentile of its peer group. Bank of Hawaii, which used to manage a growth portfolio, formed a partnership with Nuuanu-based CM Bidwell about a year ago in the core asset class. CM Bidwell continues to manage its own portfolio for ERS as well. The ERS fund was hurt last quarter in domestic fixed income because of rising inflation brought on by higher oil prices, Becker-Wold said. International fixed income suffered due to a stronger dollar, she added. However, Becker-Wold said that ERS' international equity funds managed to rise 10.2 percent despite the stronger dollar. Becker-Wold said investors likely will be shifting soon from small-cap, mid-cap and value stocks to large-cap and growth stocks. "Our outlook going forward is that small-cap stocks are now fully valued and that there should be a turnaround in the performance of large cap, particularly large-cap growth," she said. "Also, value has had quite a long period of outperformance relative to growth with the exception of the current quarter. Growth finally outperformed value. This is where people believe the market will be going forward. They see a resurgence in the performance of large cap and growth."